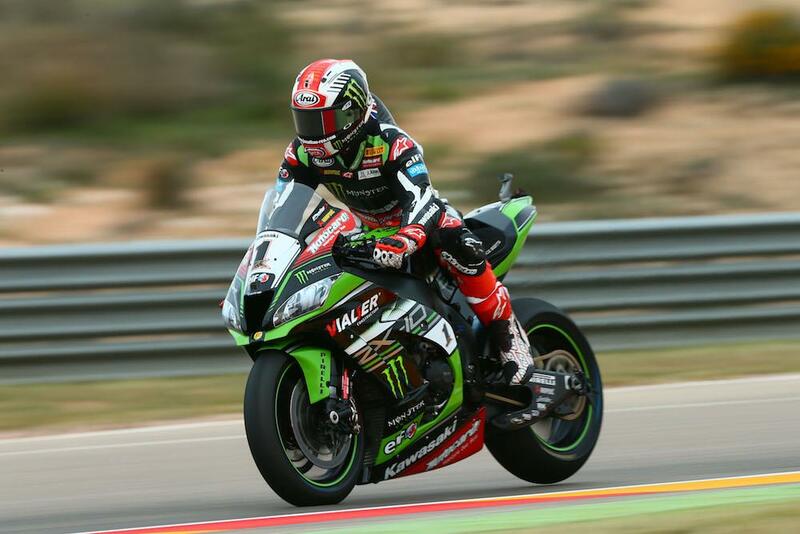 The first European-based round of the 2017 WorldSBK Championship got underway in sunshine and ended in very light rain at the Motorland Circuit in northern Spain, with the combined times of FP1 and FP2 being led by Jonathan Rea (Kawasaki Racing Team). He was also fastest in the morning and that time kept him fourth best in the afternoon until near the end. Eventually he ignored the spots of rain to set a day’s best of 1’50.062 – under the lap record but not at the track best yet. With many top riders about to start their push for a best lap, after finding a set-up to take on the first race on Saturday, a slight but track-wide fall of rain brought out the white warning flags at a tricky time for most. Marco Melandri (Aruba.it Racing - Ducati) was second fastest, another who improved despite the late spots of rain. Tom Sykes (Kawasaki Racing Team) was leading before the warning flags, and looked set to stay there, until Melandri and Rea’s late charge. He finished third fastest. Chaz Davies (Aruba.it Racing - Ducati), who lost time with a blown engine in the morning session, kept going once the light rain had passed, despite having already qualified third quickest, and easily made it through to Superpole 2 on Saturday by going fourth overall. Alex Lowes (Pata Yamaha Official WorldSBK Team) was the first rider to still rely on his morning time to go fifth, with Xavi Fores (Barni Racing Ducati), Jordi Torres (Althea BMW Racing Team) and Michael van der Mark (Pata Yamaha Official WorldSBK Team) sixth to eighth overall. 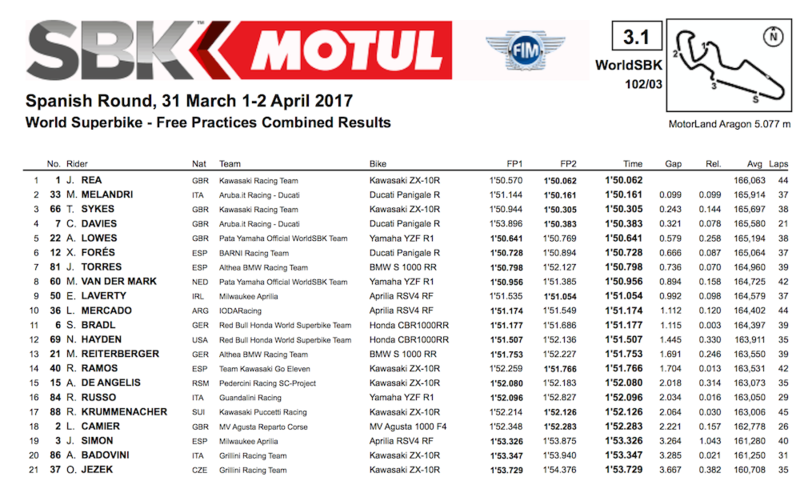 Eugene Laverty (Milwaukee Aprilia) improved in FP2 to go ninth with returnee rider from injury, Leandro Mercado (IodaRacing Team Aprilia) tenth. Stefan Bradl (Red Bull Honda World Superbike Team) and his fellow Honda rider Nicky Hayden (Red Bull Honda World Superbike Team) placed 11th and 12th respectively.